The National Museum of American History has a staggering 1.8 million objects in the collections. 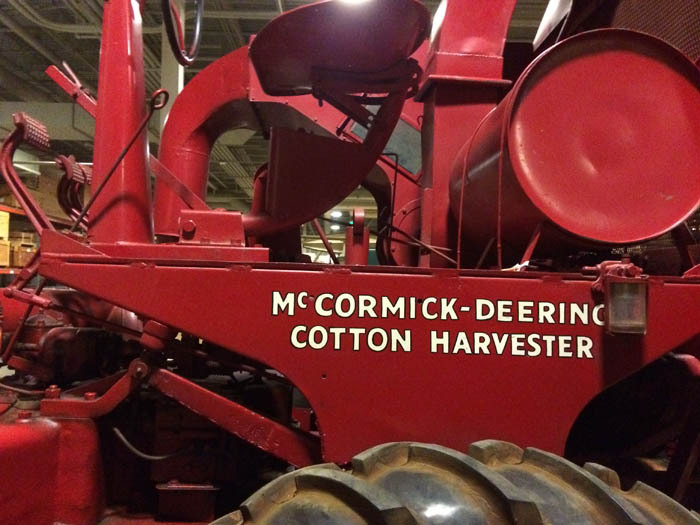 It isn’t possible for one person to know all the artifacts, but, as a curator of agricultural history, I am proud to be very familiar with the museum’s 14 full-sized tractors. Not only do these incredible objects help us explore the long history of farming, innovation, and social change, they are also just plain big. It’s hard to miss a tractor. So you can imagine my surprise when I recently discovered the 15th tractor in our collection: Old Red. I always knew about Old Red. I just thought it was a cotton picker. In the 1940s, International Harvester introduced a practical spindle-based mechanical cotton picker. To demonstrate the new technology to the expanding California market, International Harvester sold a pre-production model H-10-H single-row cotton picker to Producer’s Cotton Oil Co. of Fresno, California, in 1943. For 16 years, the harvester lumbered through the California fields, harvesting about 8,000 bales of cotton before being retired from service. This first successful mechanical cotton picker reduced the labor needs for harvesting cotton and contributed to the rise of cotton production in the American West. Before its introduction, inventors experimented for nearly 100 years looking for a mechanical cotton picker. Ideas ranged from mechanical fingers to vacuums, but an effective cotton harvester remained elusive. Since cotton does not ripen all at once, fields are picked several times, and a successful mechanical harvester cannot damage the plants. Without a good mechanical solution, growers had no choice but to have workers handpick cotton. 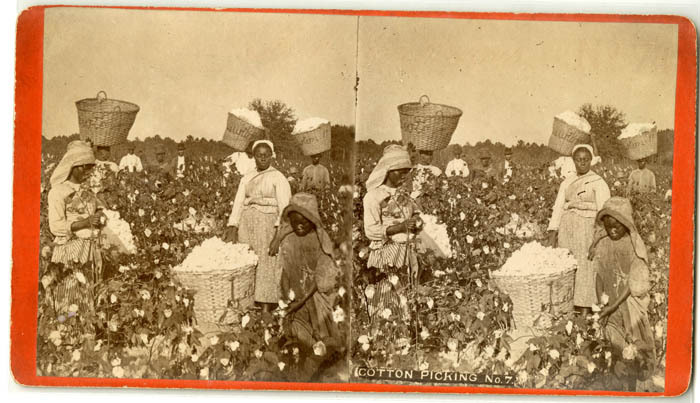 Cotton growers first depended on slave labor, and then sharecropping and migrant workers, to tend their crops. Labor conditions were often difficult. By the 1930s the introduction of tractors began displacing those laborers, making large farms easier to operate. A single operator could plow, seed, and cultivate more acres with the new machines. Old Red wasn’t just a hidden tractor—it helps us tell these hidden stories. 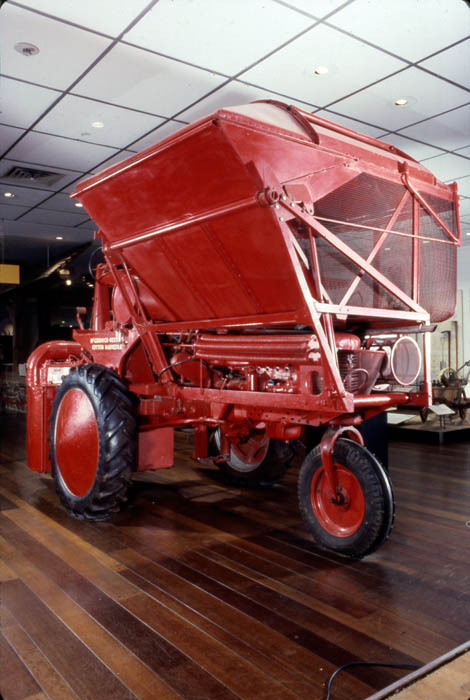 Old Red is more than just the first successful commercial cotton picker. Hidden in the bowels of the harvester is a complete Farmall H tractor. It turns out the IH H-10-H cotton harvester was in fact merely a mammoth attachment that completely engulfed a standard row crop tractor. Of course some modification was needed. In order to prevent the machine from crushing the cotton plants, the operator had to drive the tractor backward, requiring the transmission, steering, and seat to be reversed. The Farmall H was a famous tractor on its own. It was one of the first general-purpose row crop tractors, in production from 1939 until 1953. Lightweight commercial tractors like the Fordson had only been introduced in the late teens, and development of general purpose really helped the technology take off. The tricycle setup made the tractor more maneuverable than four-wheeled tractors, and its power takeoff and powered equipment lift made it immensely popular for medium-sized farms to attach different implements for different jobs. Gone were the steel lugged wheels of the 1910s and 1920s; the Farmall H sported pneumatic rubber tires, which reduced vibration and fuel consumption. From a curator’s perspective, Old Red is a fabulous object. It tells so many stories at once: Innovation in cotton picking! Invention of new technology! The adaption of tractors on small and medium farms! It also provides a window into the complicated labor history of agriculture. An FSA photographer took this photo of a tender embrace between the future and the past in Jasper County, Iowa, in 1940. 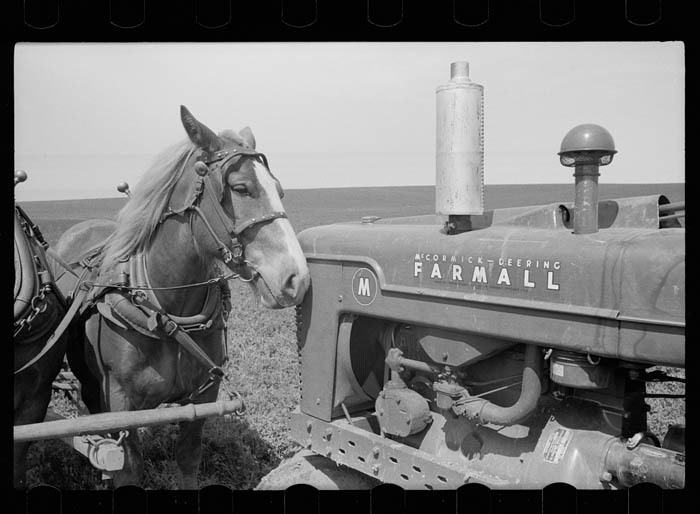 By the 1950s tractors had completely replaced animal horses and mules on American farms. Courtesy of Library of Congress. Peter Liebhold is a co-curator of the American Enterprise exhibition in the Mars Hall of American Business. Liebhold has written about Old Red for other online publications.